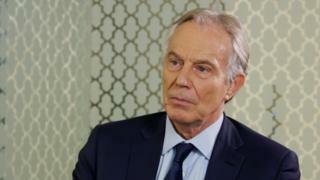 Image caption Mr Blair said there was an "emergency on our streets"
Police are currently "losing the battle" against knife crime, former prime minister Tony Blair has told the Victoria Derbyshire programme. He urged current prime minister Theresa May to hold a Cobra emergency committee meeting and act with a determination "to do whatever it takes". "If you're going to defeat something like this, right from the very top of government, you've got to have an absolute focus, total determination and do whatever it takes to get the problem solved," he said. Mr Blair said there was "an emergency on our streets, because it's creating a climate of fear," adding, "I know I'm more worried about my own children". He said: "What it means in some of our key cities is people are not feeling safe, people are reacting to their fear of what might happen to them, and this has a cascade effect. " "Of course you've got to be culturally-sensitive," he said, "but remember the communities that are most affected by these crimes are the communities that will be sensitive to these questions. Whatever it takes, you do it." In 2007, he said people had to drop their political correctness and recognise violent crime was predominantly affecting the black community - a comment he stands by. "If that's the case, you've got to engage with the community in order to make sure that problem is dealt with," he said. "You're not going to deal with it better by pretending it's something other than it is. "Telling it like it is isn't discriminatory. Failing to deal with it because it's located for example in the black community, that's discriminatory." When there was a street crime epidemic in 2002, he called a meeting of the government's emergency committee to ensure it was handled from the top level. "Out of that you'll get an itemised series of things that need to be done," he explained. "That will be about police powers, police action, it will be about local communities and how you engage them, it will probably be about the court system, it will be a series of different things which you put together." The Home Office said in a statement it was "working hard with police and other partners to tackle violent crime on many fronts and recently announced a £200 million Youth Endowment Fund to support interventions to steer young people away from violence or re-offending. "We are determined to protect our children, families and communities and our Serious Violence Strategy combines early intervention and strong law enforcement to prevent more people from becoming victims," it added.